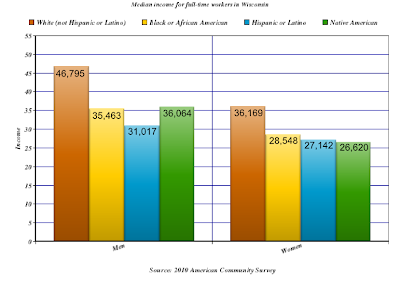 In honor of Equal Pay Day, here's a guide to research tools for locating information on the status of equal pay in Wisconsin. Two weeks ago, Governor Walker signed a bill to repeal Wisconsin’s 2009 Equal Pay Enforcement Act, which provided a means for awarding compensatory and punitive damages (in addition to back pay) to employment discrimination victims. The full text of both the repeal and the 2009 Act are available in Wisconsin Legislative Documents, along with related information such as fiscal estimates and voting records. The graph below uses data from the 2010 American Community Survey, which is available in American FactFinder, an online tool for browsing data collected by the Census Bureau. Click on the graph for a bigger version. Book sale, guest author, Friends meeting, 2012!